Luggage wheels are one of the most important parts of any wheeled luggage. Luggage with wheels that do not work has lost its main benefit. You could of course have the wheels repaired, that is if you can find reliable luggage repair shop. That can be a challenge or unpractical if the wheels break while you are on holiday. Repairing suitcase wheels does also cost and you might prefer to buy a new bag than repairing an old and battered one. The most important feature for luggage wheels is durability / quality. There are mainly four things to consider when verifying the quality of luggage wheeling system, the material, the maneuverability, how the wheels are fastened to the luggage base and how the wheels are protected. In addition, there are personal preferences, like how many wheels you prefer, should they be able to turn or not, etc. What Are In-line Skate Wheels For Luggage? In-line skate wheels were originally developed for in-line skates but are now frequently used for luggage as well because of their superior maneuverability. Hard material is superior to soft materials as soft material can become bent or deformed with frequent use. The best luggage wheels are in-line skate wheels made of polyurethane (kind of high resilient flexible plastic). These are the most hardwearing and durable wheels on the market today. Other materials used in suitcase wheels include rubber and other plastic. These materials tend to wear down too quickly or have too much rolling resistance. It goes without saying that it should be easy to roll and maneuver your wheeled luggage around. Quality brand luggage with wheels tends to be easy to maneuver but how can you tell if it is easy to maneuver luggage or not? If you go to luggage retail shop, then you can get a feeling for rolling an empty luggage case around. Just remember it is quite different to maneuver empty bag than a full one. However, if you cannot try out the actual luggage, e.g. if buying on-line, then you should go for good in-line skate wheels with good set of ball bearings, as they aid the suitcase wheels in moving around freely and prevent jamming. How Are The Wheels Fastened To The Luggage Base? The best way to fasten luggage wheels to the luggage base is with screws, not rivets. Screws not only have stronger hold, you can also replace them if needed. How Are The Wheels Protected? Most luggage has to be able to withstand some rough handling, not least check-in suitcases. This is why good wheel protection is important. Full corner protection gives the best wheel protection but partial protection is preferred over no protection at all. The best protection material is hard, e.g. high tech plastics. 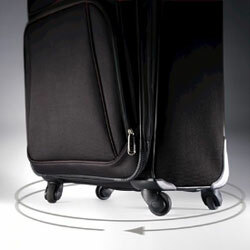 Spinner luggage is popular but the spinner wheels allow you to move the spinner easily in any direction. You can pull, push and turn your bag in any direction (360 degree rotation) with effortless mobility, reducing the efforts and strain on your arms. The biggest downside of spinner luggage is that the spinner wheels are unprotected and therefore at more risk of falling off or getting damaged in transit. It is therefore vital to check the quality and durability of spinner wheels carefully. The best spinner wheels have rigid, reinforced corners to give the wheels proper support. Other wheeling features are up to your personal preferences but it is helpful to have the following points in mind when choosing your wheeled luggage. Fewer wheels are lighter but if you use your luggage frequently in tight or narrow places, like airplane aisles, then more wheels (4 or 6) may be better option. Spinner wheels would however give you the best maneuverability. Some suitcase wheels can turn which can be beneficial in larger bags as they can be heavy to lift when full. If the wheels can turn, then you will not have to lift your suitcase to change directions. Suitcase wheels do add a little weight to the actual luggage. Most travelers though agree the benefits of being able to roll your luggage around more than makes up for it. However, if you are concerned about the luggage weight, then 2 wheels build into the corner add the least weight to the luggage piece. They prevent the bag from rolling away, which is especially important if you are buying spinner bag. Make sure the foot bumpers are sturdy enough to hold your bag in place. Always check the luggage warranty before buying as it protects you against any defects in workmanship and materials. The insurance covers tend to be quite similar but the warranty period can vary greatly (usually between 3 to 10 years). So when buying luggage on-line look for in-line skate luggage wheels made of polyurethane, with good ball bearings, that are screwed on to luggage and have full corner protection.